This photo which follows on from the previous posting appears to have been taken as the bride, Martha Mewett, and the groom, Jonathan Dover, prepare to depart the scene: the bride wears a hat, Jesse and Rhoda and some of the guests have donned their hats. Kneeling in front of Jesse is a woman I now think might be another sister of the bride, Catherine May. 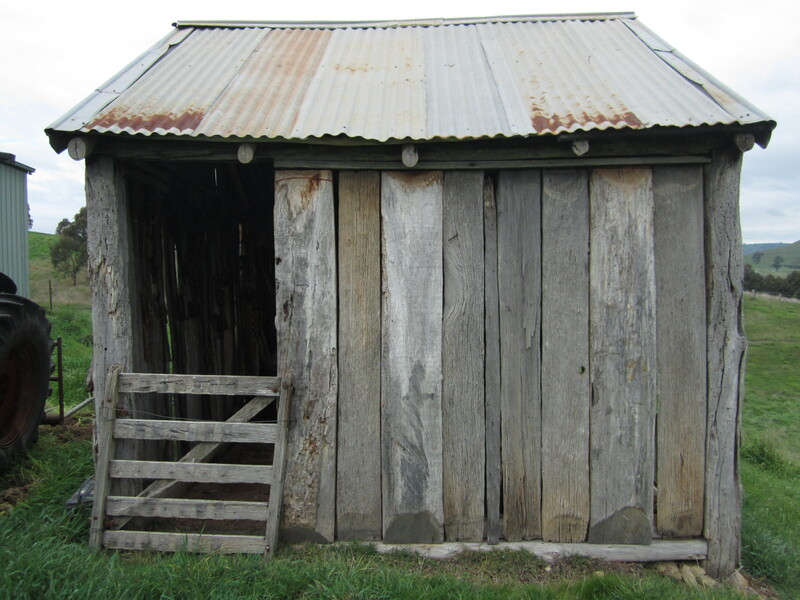 The setting of the photo in 1902 was the Jesse Mewett farm near Williamstown, South Australia. I visited this site about 35 years ago and found the ruins of the farmhouse in what was at the time a pine plantation near the South Para Dam. A close study of the guests reveals rural fashions of the day. This photo was not included in the Jesse Mewett photo album originally but was found separately. 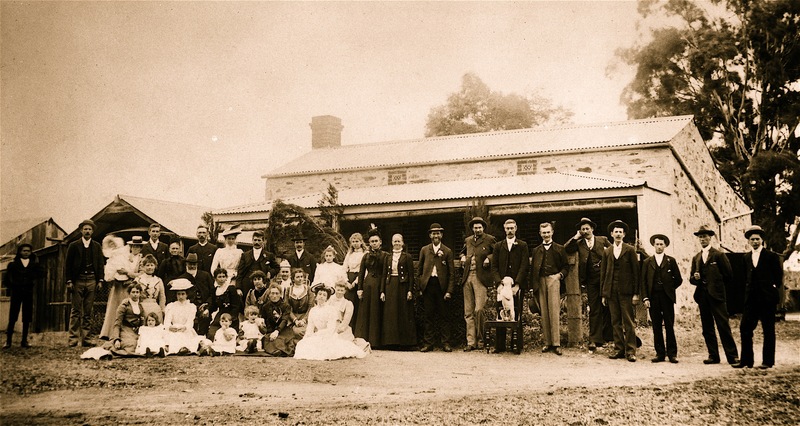 It shows the wedding party comprising Martha (Matty) Mewett as bride, Jonathan Dover as groom, parents Rhoda and Jesse seated, Rhoda Ann Mewett at Jesse’s shoulder, and possibly Catherine May Mewett to the viewer’s right. Unknown lady possibly groom’s mother. Taken at Mewett farmhouse near Williamstown, South Australia – 1902. Witnesses who signed the Marriage Certificate were Rhoda Ann and D.H.Parker; we cannot be sure that the best man shown in the photo was D.H.Parker. And the dog; we might suppose that he was called Spot? Top: Upright/vertical timbers at Brooklands, probably those from the old Meadowbank farmhouse. Third photo: It is thought that the farmhouse was once located to the left in the photo on patch of dry grass behind row of pines/callitris, near road entrance. Fifth photo: Overall view includes Pollock Avenue off Maroondah Highway, giving access to properties. Brankeet Creek in foreground. Sixth photo: Western boundary easily identified as fence line going uphill from middle right-hand of the photo. 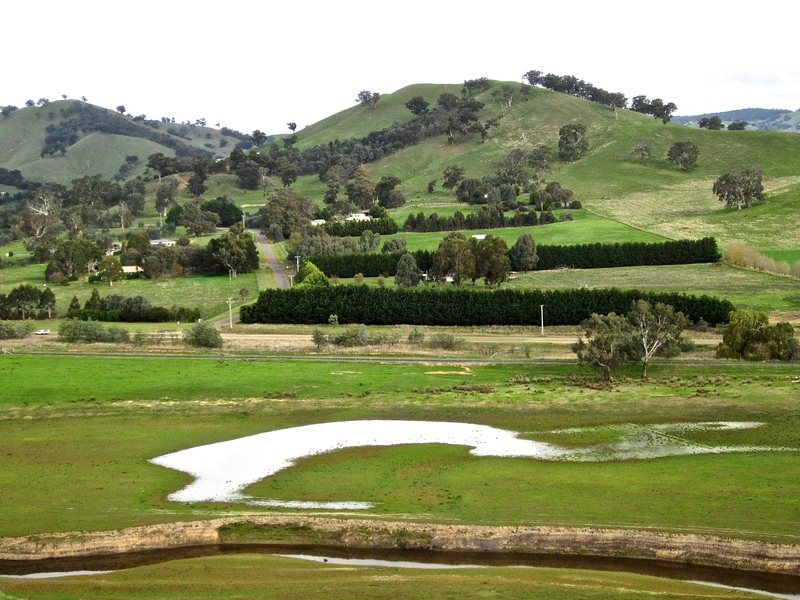 Above are recent photos of the subdivided blocks, now hobby farms, that make up what was once Meadowbank, the Pollocks’ farm at Bonnie Doon, Victoria. The proliferation of mature trees planted during the past 40 years or more now give an appearance of good fertile soils and caring development of the area. 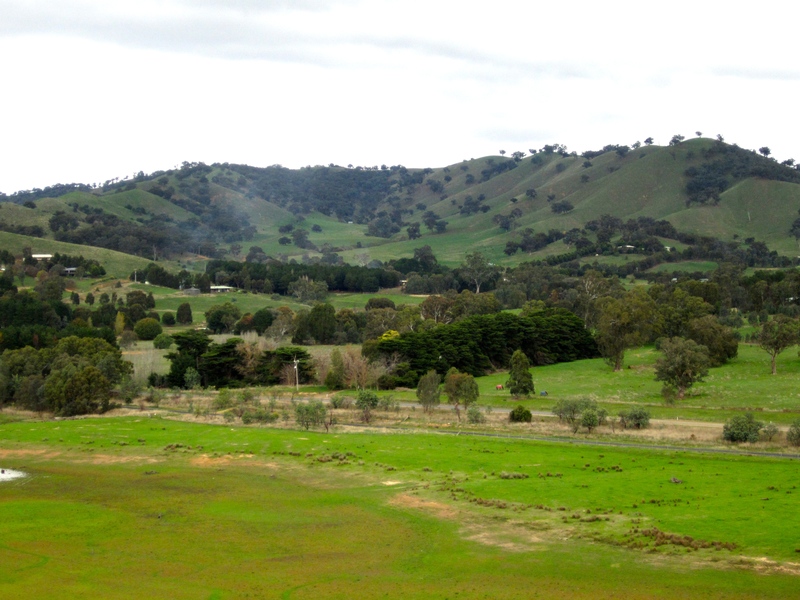 These south-facing photos were taken last year (2014) from across the Brankeet Creek, also known as the Bonnie Doon backwater of Lake Eildon, after I had made my way past grazing cattle through well-maintained gates but having to climb gingerly and carefully the last, a locked gate not intended to allow 85-year-old trespassers to gain advantage points for better pictures. Meadowbank was sold by the Pollocks after the death of my grandfather, William Pollock, in 1928 to the Anderson family who moved a nearby house in the town to the property to replace the old farmhouse. 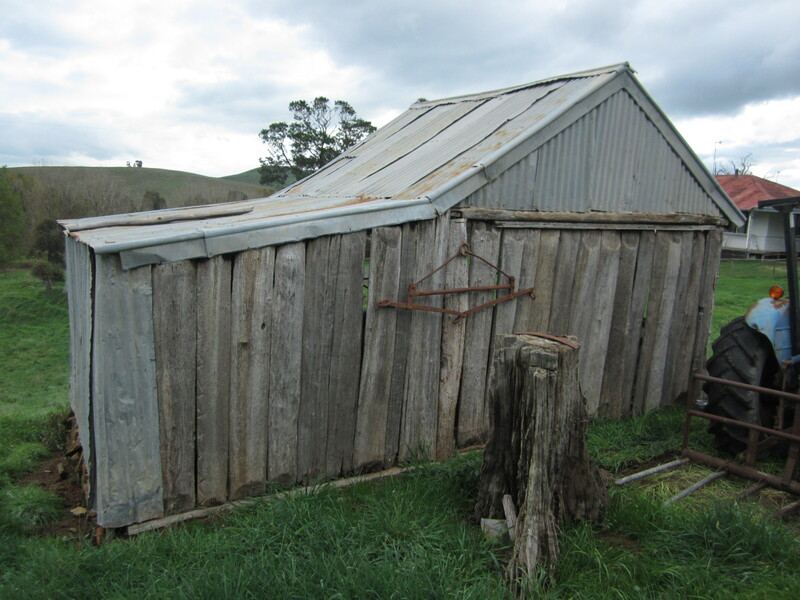 Verticle timbers of the old place were then relocated for sheds on the farm Brooklands on the Ancona Road at Woodfield where my aunt Lilian with her husband Robert Stanley Black raised my cousins: Bob, Marjorie, Betty, Gwen and Bill (twins), Rae and Neil. After Uncle Bob (R.S.Black) died, Neil took over management of the farm until his recent death. Meadowbank was sold to the Mitchell family and it was subdivided in the 1970s. Two months ago my second great-granddaughter was born in Perth, W.A., and she was given the names of Charlotte Rose. Before her birth I was asked by her mother for a list of given names from our family tree; but I did not include names of siblings of my forebears. But the name Charlotte rang a bell when I first heard the new baby’s name. Delving through my family history files, I found it : Charlotte – the name of the elder sister of Jesse Mewett, my great-grandfather. She was born in Willingdon, Sussex, in 1833, third child of Samuel Mewett and his wife Martha Balcombe and she sailed on the Platina with them arriving at Port Adelaide in February 1839. At age 18 Charlotte was married to Thomas Barber at Gumeracha, S.A. She gave birth to eight sons and six daughters from 1852 through to 1879. 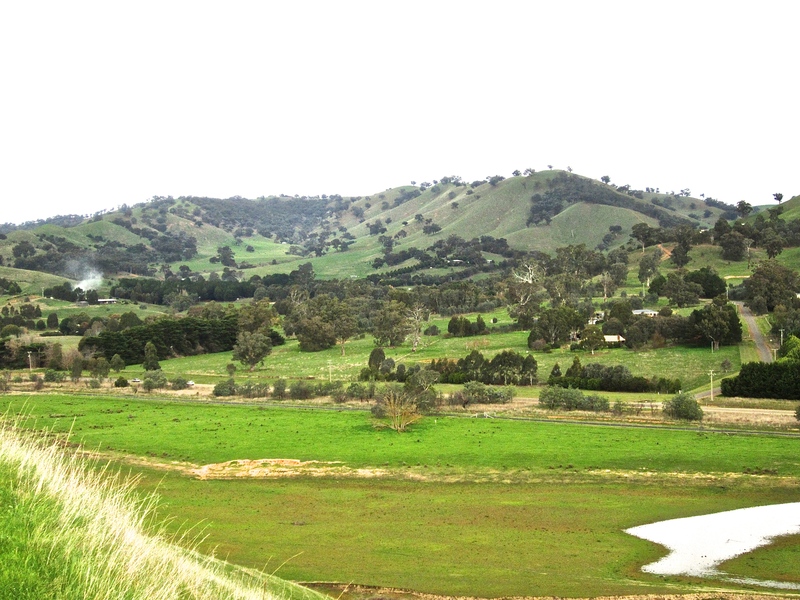 Thomas and Charlotte Barber moved from the Kersbrook/Gumeracha district of South Australia in 1873 and settled on a farm at Wail, north of Horsham in Victoria. Two of their children were born there, Samuel in 1875 and David in 1879. Martha aged 8, died of diphtheria at the Horsham hospital in February 1878; Selina aged 9, and Alice aged 5, died at Wail in March of that year, also of diphtheria. Names of the surviving children were Ann, John, William, Elizabeth, Robert, Richard, Susanna, Thomas, Samuel and David. Charlotte died at Pomona, Victoria, aged 71, and was buried at the Horsham cemetery. Wail has a Barber Road running east through farmland from the Wail-Polkemmet Road to the Western Highway between Horsham and Dimboola. There are still residents today at Wail by the name of Barber. By today’s travel standards Wail would be on the same map as Noradjuha where the late Bob Mewett and his family lived; Murtoa where Ted Mewett married Emma Lloyd and where my father Percy was born; Horsham where Wm Lloyd my great-grandfather was buried, and an area where some of the Giddings migrated to in the 19th century. Pomona is a town south-west of Stawell and north-west of Ararat and close by Lake Bellfield in the Grampians National Park. Pomona would be on the same map as Stawell where my grandmother Emma Lloyd was born; two of my Mewett aunts were born at Maroona, a railway town south of Ararat and Pomona. Quite some family history in this Wimmera district of western Victoria. 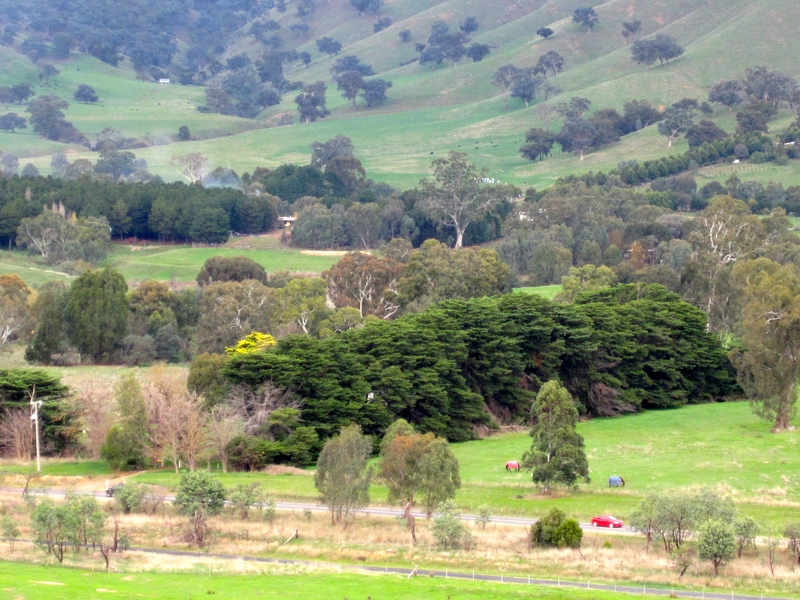 We have noted that fires currently burning in the Adelaide Hills in the Sampson Flat and Humbug Scrub areas have threatened towns and districts where our Mewett and Giddings forebears settled 160 years ago, namely, Kersbrook, Gumeracha, Williamstown, Chain of Ponds, Forreston (once known as North Gumeracha), and Kenton Valley. The ABC online news service gives the Country Fire Service listing today (4 January 2015) – including among others: grass fire at Checker Hill Road, Kersbrook; tree fire at Retreat Valley Road, Gumeracha; tree fire at Rake Road, Kersbrook; grass fire at Redgum Lane, Kersbrook; grass fire at Mewett Road, Kersbrook; grass fire in Kenton Valley, Gumeracha. I commented in a post on this blog some years ago that the Mewetts and other emigrants in the 19th Century had given up the hellish economic conditions experienced by agricultural workers in southern England for the Australian hell of drought, bushfire, flood, pests, etc. but I did not imagine then how close to the truth this would become in the areas settled by our great-great-grandfathers. May the outcome of these current fires in the Adelaide Hills not include any loss of life and minimal loss of livestock and property. This photograph was kindly sent to me by David Brace, grandson of Robert and Martha Brace who were married at Kanumbra, Victoria, in 1917. See previous post for details of wedding party, bride’s dress, gifts, family and friends present at the ceremony. The following report was forwarded to me by Darryl Mewett, researcher of Mewett family history worldwide, which he found while delving into Trove for newspaper reports which included the name Mewett; as you will see in the body of the report Mrs P. Mewett was listed as a donor of cutlery to her sister Martha Pollock on the occasion of Martha’s marriage/wedding to Robert Brace. The report was from the Yea Chronicle published 18 October 1917 and headed “Orange Blossom”. I reproduce it as published (except for punctuation modifications) but will explain the personalities and their relationships as a postscript; these people included my mother, grandparents, aunts, and great-aunts and great uncles. 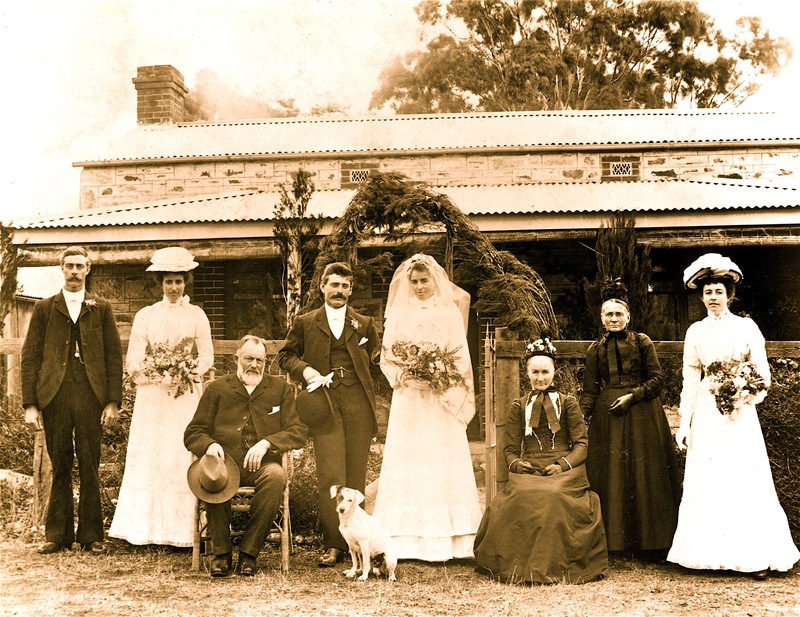 A very pretty wedding took place on Wednesday, 12 October 1917, at “Spring Vale” Kanumbra, the residence of Mr John McGuigan. The contracting parties were Robert (late of the A.I.F. ), son of Mr R. Brace of Kerrisdale, and Martha Elizabeth, daughter of Mr and Mrs W. Pollock of Bonnie Doon. The Rev W. C. Jones, of Alexandra, performed the ceremony. The bride, who was given away by her father, was attired in a very pretty gown of white China silk with soft lace and ninon effect, and wore the customary wreath and veil, and carried a bouquet of trumpet lilies, snowdrops and asparagus fern. Miss Marion Pollock, who acted as bridesmaid, was dressed in a Fugi silk costume. Mr H. McGuigan acted as best man. There were about 30 relatives and friends present, and the exquisite breakfast was a picture of perfectness. Mrs H. Day, a resident of Kanumbra, is responsible for this most important adjunct, and is to be highly commended for the manner in which she laid out and superintended the dainty repast. The usual toasts were proposed and responded to in an able manner. The happy couple left by motor en route for Melbourne amid the hearty good wishes of their friends and showers of confetti. The travelling costume was of navy serge, with hat to match. Bride to bridegroom, gold sleeve links. Bridegroom to bride, gold pendant and chain, and to the bridesmaid, a gold bangle. Miss E. McGuigan, household linen, tea set and cheque. Mr and Mrs W. Pollock, cheque. Mrs R. S. Black, sugar basin and cake dish. Miss A. Pollock, salad bowl. Miss Marion Pollock, silver butter dish and knife. Miss Annie Pollock, silver cruet. Master W. Thompson, pair silver salt cellars. Miss L. Thompson, silver and glass honey jar. Miss M. Thompson, silver butter dish and knife. Mr and Mrs Jas. McGuigan and Mrs Mintern, silver teapot. Mr H. McGuigan, silver and glass sweets jar. Mr and Mrs H. Kubiel, cheque. Miss Jean Almond, pair of vases. Miss Madge Almond, butter dish and sugar basin. Postscript: 1. The bride, Martha (“Markie”) Elizabeth, was the youngest child of my grandparents, William and Mary Anne Pollock. Her mother possibly suffered what we now call “post-natal depression” after the birth of Martha and was not coping well with her larger family. Her sister, Elizabeth McGuigan, single and childless, gathered up her niece and took her home to care for her at Kanumbra. John McGuigan, bachelor farmer, was no doubt easily inveigled into this arrangement. 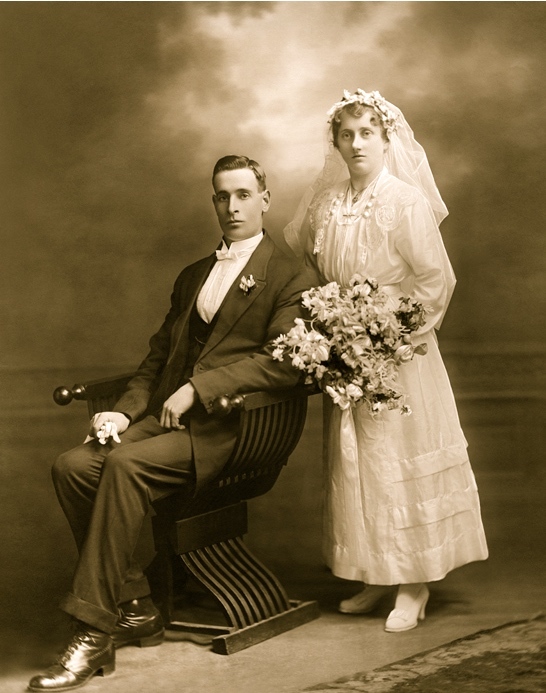 It is understandable that the wedding was held at “Spring Vale”, the McGuigan farm. 2. Martha’s sister, Marion Pollock, the bridesmaid, remained single and was later carer and housekeeper to her mother, Mary Anne. 3. Mr H McGuigan, the best man, was Herbert James, son of James McGuigan, and cousin of the bride. 4. Mrs R S Black was Martha’s eldest sister, Lily Florence, married to Robert Stanley Black, farmer of Ancona Road, Woodfield. 5. Mrs P Mewett was another sister, Margaret (Maggie), married to Percy Mewett (the blogger’s parents; thereafter, Maggie always gave cutlery sets as wedding presents). 6. Miss A Pollock was another sister, Alice, later married to Angus Boyd and settled in W.A. 7. Miss Annie Pollock was sister Mary Ann, later married to George McLean. 8. L/Cpl David Pollock, brother, was overseas with the A.I.F. at the date of the wedding. 9. Mrs Thompson would have been Martha’s Aunt Martha, married to Jack Thompson of thereabouts. 10. James McGuigan was Mary Anne Pollock’s twin brother, uncle of the bride. 11. Mrs Mintern was Irene Jane, daughter of James McGuigan, and cousin of the bride. 12. Mrs Kubiel was Jane McGuigan, married to Ernest Henry Kubiel, and younger sister of Mary Anne Pollock and aunt of the bride. 13. Mrs Almond was Margaret McGuigan, sister of Mary Anne Pollock, married to Robert Almond, and mother of Jean and Madge Almond, cousins of the bride. 15. Bob Brace had been a bullocky in his young days and retained the bullocky’s colorful language even after years of farming and a long convalescence and retirement. When I read the first chapter of Joseph Furphy’s Such Is Life with the bullock teamsters yarning around the campfire with their “bloody”s, and “hell”s etc. portrayed by Furphy in words acceptable to the puritans of the 19th Century in brackets, I think of Uncle Bob and his yarns when I visited the Braces at Mackay Street, Seddon, say, fifty years ago. The following information about returned A.I.F. servicemen has been extracted from World War 2 Nominal Rolls, National Archives records and genealogical research by the late L.Robert (Bob) Mewett and Darryl Mewett. Digitised war records for most of these returned servicemen were not available for viewing online. The listing below is in alphabetical order. It is by chance that the last names are of servicemen who were killed while on active service. Arthur Mewett, service no. NX165265, born Campsie, NSW, 5 October1919, enlisted at Ingleburn, NSW. Next of kin: Hilda. Clarence James Mewett, service no. SX18444, born Williamstown, S.A., 24 April 1904, enlisted at Wayville, S.A. Next of kin: Avis (wife)(nee Millington). My comment: great-grandson of Samuel and Martha, grandson of Jesse and Rhoda, son of James Clarendon and Grace (nee Whiteman). Clifford Herbert Mewett, service no. SX 27524, born Williamstown, S.A., 21 July 1916, enlisted at Alice Springs, N.T. Next of kin: James (father). My comments: great-grandson of Samuel and Martha, grandson of Jesse and Rhoda, son of James Clarendon and Grace (nee Whiteman), brother of Clarence James (see above). Douglas Ross Mewett, service no. QX33582, born Kilcoy, Qld, 30 July 1921, enlisted at Biggenden, Qld. Next of kin: Margaret. Geoffrey Lloyd Mewett, service no. VX21163, born Sunshine, Vic, 4 October 1920, enlisted at Caulfield, Vic. Served with 2/4th Field Regiment in Middle East as signaller. My comment: great great-grandson of Samuel and Martha, great-grandson of Jesse and Rhoda, grandson of Edward (Ted) and Emma (nee Lloyd), son of Percy and Margaret (nee Pollock), brother of almewett. Gordon Mewett, service no. SX29468, born North Adelaide, S.A., 3 October 1910, enlisted Katherine N.T. Next of kin: Eva (wife)(nee Selway). My comment: great-grandson of Samuel and Martha, grandson of Jesse and Rhoda, son of Rhoda Ann Mewett. Herbert George Mewett, service no. QX61498, born Caboolture, Qld, 30 December 1909. Next of kin: Bernice. Ivan Mewett, service no. VX38459, born Wycheproof, Vic, 7 November 1918, enlisted at Royal Park, Melbourne. Next of Kin: E.Mewett (father). My comment: great-grandson of Samuel and Martha, grandson of Jesse and Rhoda, son of Edward (Ted) and Elsa (nee Geiger). Jack Mewett, service no. NX31385, born Annandale, NSW, 12 July 1913, enlisted at Paddington, NSW. Next of kin: Thomas. James Lambert Mewett, service no. NX47205, born Wallsend, NSW, 16 May 1901, enlisted at Newcastle 26 July 1940. Next of kin: Ida (wife). Rank at discharge: Warrant Officer class 1. My comments: great great-grandson of Edward (b.1776) and Elizabeth (nee Rigglesford), great-grandson of Jesse (b.1802) and Sarah (nee Buss), grandson of William and Henrietta (nee Relf), son of Charles and Sarah (nee Lambert). John William Mewett, service no. VX58050, born Mentone, Vic, 7 January 1922, enlisted at Royal Park, Melbourne. Next of kin: Charles. Leslie Mewett, service no. VX73875, born Wycheproof, Vic, 6 July 1912, enlisted at Caulfield, Vic. Next of kin: Alice (wife)(nee Quick). My comment: great-grandson of Samuel and Martha, grandson of Jesse and Rhoda, son of Edward (Ted) and Elsa (nee Geiger). Murray Laurence David Mewett, service no. SX 28621, born Gawler, S.A., 16 September 1906, enlisted at Katherine, N.T. Next of kin: Alfred (brother). My comment: great-grandson of Samuel and Martha, grandson of Jesse and Rhoda, son of David Wm and Eva (nee Trestrail), brother of Frank Gawler (see previous post re First World War Mewetts). Raymond Valentine Mewett, service no. VX 45626, born Noradjuha, Vic, 29 June 1900, enlisted at Caulfield, Vic. Next of kin: Annetta (wife)(nee Dawkins). My comment: great-grandson of Samuel and Martha, grandson of Robert and Eliza Rebecca (nee Manser), son of Andrew and Annie Louisa (nee Coates), uncle of L.Robert (Bob) Mewett. Rodney Mewett, service no. NX25049, born Campsie, NSW, 9 February 1918, enlisted at Paddington, NSW. Next of kin: Thomas (father). My comment: son of Thomas Henry and Hilda (nee Berrisford). Thomas Marshall Mewett, service no. SX12890, born Kersbrook, S.A., 30 January 1920, enlisted at Adelaide, S.A. Next of kin: Ernest (father). My comment: great-grandson of Samuel and Martha, grandson of Thomas and Caroline (nee Meakins), son of Ernest Marshall and Ruby Verna (nee Warner). William Alexander Mewett, service no. QX30709, born Kilcoy, Qld, 26 March 1919, enlisted at Brisbane. Next of kin: Margaret. On ANZAC Day this year I watched the televised versions of the dawn services and part of the Sydney march of the veterans. I thought of my Uncle Dave Pollock who fought and was wounded, gassed in France during the 1st World War, my brother Geoff who was in the Middle East with the 2nd AIF when he was injured with other troops in a vehicle accident, and my cousin Mervyn Brace who was a prisoner of war held by the Japanese. It dawned on me that there would have been many more Mewetts who served in both wars. I searched without success in my disorganised paper files and folders for a list I had once seen; however, using Spotlight, a Mac application, I located the list of names hidden away in my computer files, and then downloaded further information from the National Archives and the Australian War Memorial. Genealogical information was sourced from research by the late Bob Mewett and Darryl Mewett. Charles Mewett, Private No. 903, of the 5th Battalion, who enlisted at Ripponlea, Vic.,17 August 1914. He was born at Mentone, Vic. Next of kin: Thomas (father). Frank Gawler Mewett, Private No. 7036, of the 4th A.S.C., enlisted at Adelaide, S.A., 23 October 1916. He was born at Gawler, S.A. on 1 October 1897. Stated next of kin: Eva Mewett (mother). My comment: Frank was a great-grandchild of Samuel and Martha, grandson of Jesse and Rhoda, son of David William and Eva (nee Trestrail), and cousin of my father Percy. Harold Ernest Mewett, Sapper No. 21615, of the 2nd Field Squadron (Signals), who enlisted in Brisbane 30 May 1917. He was born at Caboolture, Qld. Next of kin: Alfred Ernest Mewett (father). John Scott Mewett, Private No. 4473, of the 28th Battalion, who enlisted at Blackboy Hill, W.A., 15 February 1916. He was born at Busselton, W.A. Next of kin: Robert Mewett (father). Walter Leslie Mewett (a.k.a. Leslie Walter), service number 6062, who enlisted in Adelaide, S.A. He was born at Kersbrook, S.A. Stated next of kin: Mary Jane Mewett (mother). My comment: he was a great-grandson of Samuel and Martha, grandson of Thomas and Caroline (nee Meakins),and son of William Samuel and Mary Jane (nee Stephenson). William Charles Mewett, service number 95735, who enlisted at Wallsend, NSW. He was born at Wallsend. Next of kin: James Mewett. Major James Edward Hedley Mewett, M.C., O.B.E., enlisted in the Auckland, N.Z., Infantry Battalion 4 January 1915. He served at Gallipoli; wounded in action in France 21 February 1917 losing his right hand. 1918-19 Company Commander N.Z. Command Depot, Codford, England. He returned to N.Z. aboard SS Ionic 25 October 1919. He was born in Australia in 1893 and emigrated to N.Z. shortly afterwards. His father was James Mewett from Newhaven, England, a distant cousin to Frank Gawler Mewett (see above).